Allegheny College was originally spelled ‘Alleghany College’ when Timothy Alden first founded it in 1815. 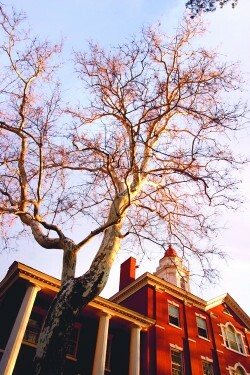 Legend has it that Timothy Alden himself planted the great sycamore in front of Bentley Hall in 1822 under the classical belief that certain trees planted at the southwest corner of a building would bring prosperity to the building’s inhabitants. Allegheny College is the oldest college in continuous existence under the same name west of the Allegheny Mountains. Current English professor Jim Bulman has also served as both the Dean and Acting President of the College. In December 1905, Allegheny’s President Crawford presented his views about the moral health of intercollegiate sports to a meeting in New York City. Out of that gathering would come the National Collegiate Athletic Association (NCAA) with Allegheny as one of its seventeen charter members. In 1901, Allegheny became host to the fifty-first chapter of Phi Beta Kappa. The purpose of the society, from its beginning in Williamsburg, Virginia in 1775, were to promote scholarship, friendship, and, in more recent decades, the liberal arts. The “Rules for Freshmen Men” published in 1919-1920 “By order of the student senate” included directives such as: 2. Freshmen must use only the sidewalks on the campus; 6. Freshmen must wear black sox and black sox only; and 8. Freshmen must build college bon-fires when so directed by the College Cheer-Leader.